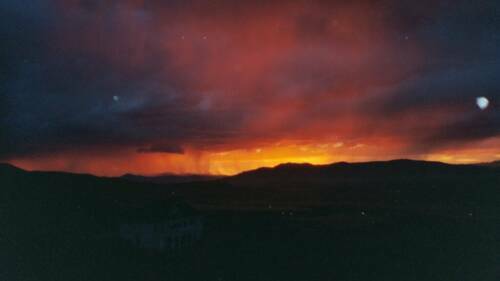 These were taken from the deck of our home, looking toward Utah Lake and the Oquirrh Mountains, toward SLC. The camera is a Kodak Advantix C750, and Kodak APS film, ASA400 was used. This is an automatic camera with built-in flash. UUFOH: were the anomalies visible during the time you were taking the photos ? Reply: No, they were not visible when I took the pictures. 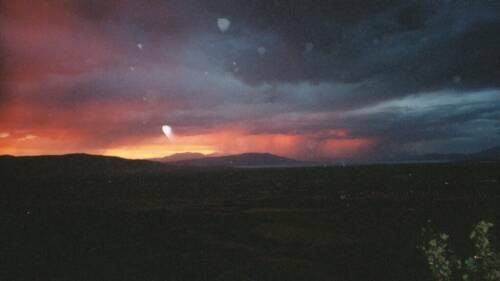 What I was taking was only a beautiful sunset. We were really surprised when we looked at the pictures after developing. My time stamp was off because these were sunset pictures, but it does show how closely together they were taken. #1 was #1 on the roll; #2 was #4 on the roll, and #3 was #5 on the roll.